For the last 13 days, I’ve been on a dietary experiment – a detox, if you will. I decided to eliminate all caffeine (yep, no coffee), sugar (no fruit either), gluten and dairy from my diet. Yup. No sugar, coffee, gluten or dairy for at least 2 weeks. Why in the world would I do that, you might wonder? Well, all of the above food groups are known to either be common allergens or to cause known health issues in people, and I wanted to know what it would feel like to go without for a while. It needed to be long enough to really feel the detox, so we started with 14 days, with the idea of extending it if it felt great (it does). I’d gone off coffee (my only source of caffeine) before, so I knew what I was in for there: the first day is miserable. If you’re going to do this, start on a Saturday morning and make zero plans to see anyone, anywhere. You’ll be feeling pretty antisocial. On day two, the fog begins to clear and you’re feeling halfway functional. By day three, you’re not 100%, but your back up and rolling, and if you’re not feeling like your normal self, you can at least act like it. So if day three is a Monday, you’ll at least be able to be civil to your colleagues and loved ones. By day four, you start to feel really great. Light. Refreshed. Sleeping better than ever. Clear-headed. It’s pretty amazing. You may never want to go back to the old you. I didn’t have any experience with getting rid of dairy, sugar and gluten, though, so I wasn’t sure how I’d react. We’ve been free of white and other refined sugars for a while now, but have used other, natural sweeteners: dates, maple syrup and honey, mainly. We also ate a lot of fruit, and on this detox program the only fruits allowed would be berries and pomegranate seeds. 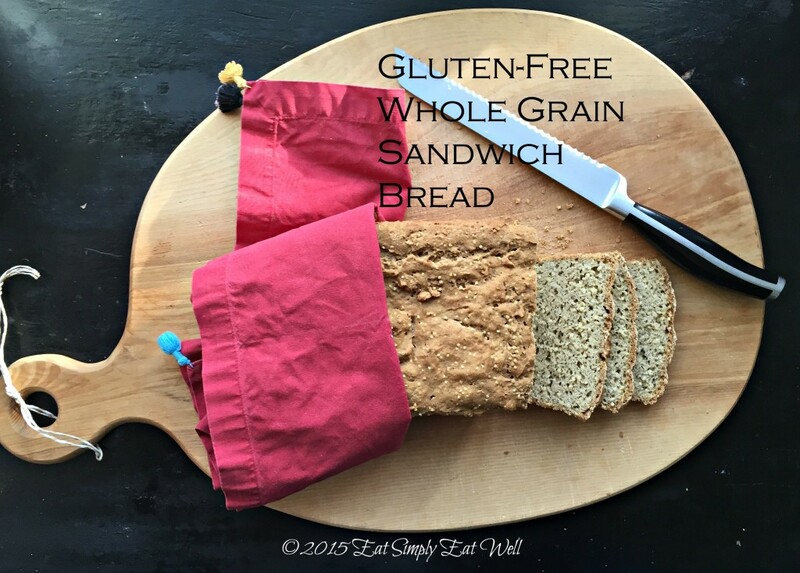 Whole wheat sourdough bread has long been a mainstay of our diet; that had to go too. Dairy was something I consumed every day: yogurt in the morning; cream in my coffee; milk in my latte; kefir as an afternoon snack or in a smoothie. It turns out that detox from sugar, dairy and gluten has some of the same effects as a detox from coffee does. Anytime we remove a substance from our diets that our bodies have become dependent on, we suffer withdrawal symptoms. Of the foods we removed, coffee (or caffeine) and sugar or known to feel the most difficult. But we got through it, and so can you. And really – I’m not interested in adding either sugar or coffee back in very soon, because so far, I like where things are going. Is this a forever thing? Maybe not. But it’s the way we’re cooking and eating for now. So we were talking major lifestyle change. How do you prepare for that? Here’s the good news: protein sources, vegetables, and gluten-free whole grains were still OK, so actually, we had a lot of fun coming up with new recipes trying different types of vegetables: pumpkin, eggplant, cabbage, tomatoes, red peppers, carrots, brassicas and more – the vegetable world has such an incredible array of delicious options, we’ll never run out of ideas. We’ve also included sustainable animal protein: mainly beef, chicken and fish. We don’t actually eat very much animal protein anymore, so we leaned more towards the occasional tofu dish and then consumed a lot of different, colorful beans like black beans, chickpeas, kidney beans and lentils. And of course gorgeous whole grains: buckwheat, brown rice, whole oat groats, quinoa, and amaranth. Our main courses were really satisfying, and you’ll see some of them showing up on the blog in the coming weeks. Breakfast posed a bit of a problem: what do you eat when you’re used to have yogurt and muesli (sweetened with maple syrup)? The answer: sugar free coconut muesli with almond milk, rice milk, oat milk or cashew milk. Smoothies with protein powders, avocado, coconut milk, berries, and nuts or seeds have been so delicious. Or, we’d have an egg scramble with vegetables and on those days, we felt like we were on vacation. I stopped missing coffee by the end of the first week, incredibly. What I missed most was fruit…and bread. Whenever I’d cook up a soup, I’d want bread to go with it. We had gluten-free crackers that I make all the time anyway, but that didn’t really fit the bill. I checked local shops for gluten-free breads, and all I could find were pre-packaged shelf varieties that were both expensive and unappealing. But we live in age of digital information at your fingertips. I turned to one of my favorite blogs, Cannelle et Vanille, because I know all of her recipes are gluten-free. This led me to the Martha Stewart web site and a recipe for Gluten-free Sandwich Bread. Hope was on the horizon. 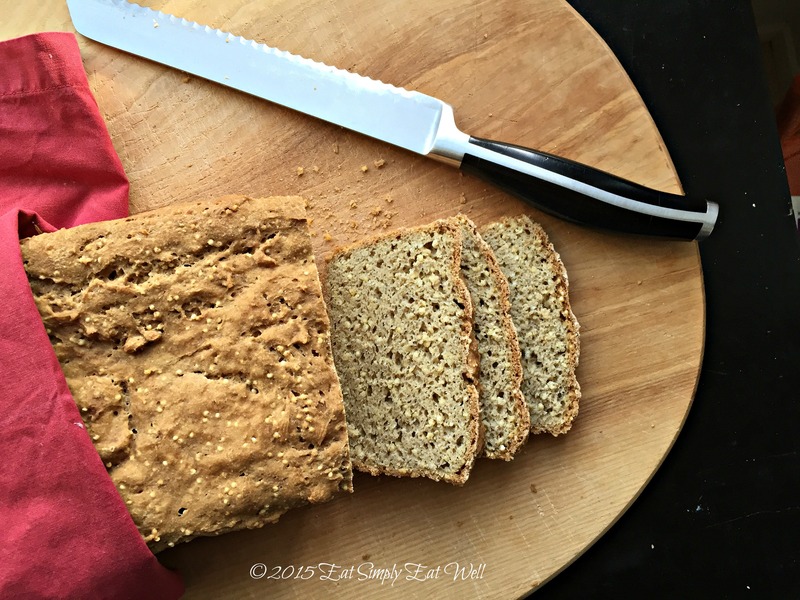 I made a few tweaks to the recipe, and the result is a bread that would make me happy whether I was allowing myself to eat gluten at the moment or not. It has the great texture you expect in a good sandwich bread, with a crunchy crust and a soft crumb, and satisfying heft. It’s great fresh or toasted, and goes with everything. I’m calling it a winner. 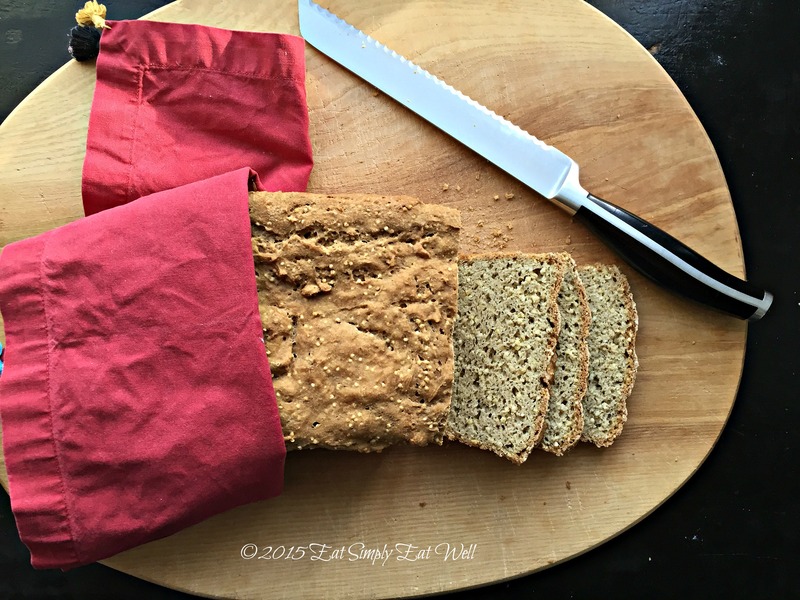 So if you or someone in your life can’t eat gluten, make this bread. You’ll be so glad you did. The original recipe called for tapioca flour which is hard to find in Finland, and expensive. I subbed in potato flour, but you could also use cornstarch (make sure it’s non-GMO). With bread like this, I’m ready to continue my detox experiment for a few days longer, though next week, we’ll be adding fruit, with the exception of bananas, grapes and melons, back into our diet. Happy Days! Combine the yeast and 1 cup warm water (45°C/115°F) in a small bowl and allow to sit for 5 minutes. In a separate bowl, beat the eggs and oil together. Combine the flours, xanthum gum and salt in a large bowl. Pour the yeast mixture and the egg mixture over the top of the flour mixtures and stir well to combine. Add the cooked millet, and continue to stir the mixture (or use your stand mixture with the paddle attachment) for an additional 3-5 minutes. The mixture will be like a thick, smooth muffin or cake batter. Use a spatula to scrape the mixture into your prepared loaf pan and smooth the top. Cover with a clean dish cloth and allow the bread to rise in a draft-free place for roughly 1 hour – until the dough has risen slightly above the top of the pan. Place the bread into the hot oven, and immediately lower the temperature to 175°C/350°F. Bake for one hour, or until the bread is golden brown and makes a hollow sound when you tap on the top. Remove the bread from the pan, loosening the sides with a knife if necessary. Cool completely on a wire rack.